Two children, aged three and five, have been injured in a "serious" crash in Birmingham. 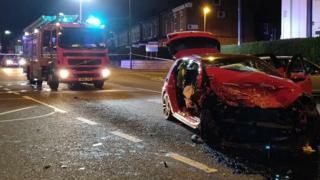 Two adults suffered "possible life-changing injuries" in the crash involving their people carrier and a car in Summer Road, Erdington, just before 23:00 GMT on Saturday. All four have been taken to hospital along with the driver of their car. Police closed Summer Road at its junction with Sutton New Road and York Road and have appealed for witnesses.